Caribbean Vacation Rental Villa Villa Soleil St Croix US Virgin Islands. Late Deals, Special Offers. Secluded, luxurious, oceanside St. Croix villa. Vacation rental. This secluded oceanside rental villa on St. Croix, U.S. Virgin Islands, has the perfect location for your Caribbean dream vacation. Let your stress melt away in the sun as you enjoy its stunning 300-degree views, a 5-minute walk to the ocean, a short drive to Christiansted, and private pool. Our spacious villa has enough privacy for a couple on their honeymoon or can comfortably accommodate up to 14 people. There are many activities to enjoy while staying at Villa Soleil and vacationing on St. Croix. You could spend an entire day sipping rum punch on the oversized open deck of the villa watching the array of activity below - sailboats, kayaks, scuba divers, and, after a colorful island sunset, the lights of passing cruise ships far out in the Caribbean sea. Prefer the beach? It's an easy walk to either white, sandy Judith's Fancy beach or the coral filled inlets around White Horse Reef, and a quick 10 minute drive to historic Columbus beach. Both spectacular Turtle Beach at Buck Island, voted one of the ten best Caribbean beaches and private Jack's Bay are easily accessible from Villa Soleil's central St. Croix location. Or.... perhaps you'd rather just lounge by the pool in complete seclusion and let the sound of the surf lull you to sleep? Whatever your activities, Villa Soleil is a vacation rental equipped to be a complete home away from home. It's open floor plan, ocean views from every room and huge deck gives you room to spread out and relax. Villa Soleil has 3 bedrooms, 2 baths, a formal dining room, sitting room, family room and a large kitchen on the main floor. Ocean views from every room and huge deck gives you room to spread out and relax. Downstairs there are 2 more bedrooms, 1 full bath, kitchen, and sitting room with a futon couch/bed. Laundry facilities cable television and air conditioning throughout are just some of the added amenities. It's the perfect way for you to enjoy your Caribbean vacation! Villa Soleil is a handicapped accessible villa. All the rooms of the main floor, as well as the pool area, are on the same level, therefore there are no stairs to negotiate. The doorways are wide, allowing access for most wheel chairs. In addition, the master bath has a removable showerhead for bathing, a stool to site on, and, if requested, we can install the ramp for the front door. Please let us know of any special needs when making your rental inquiry or reservation. 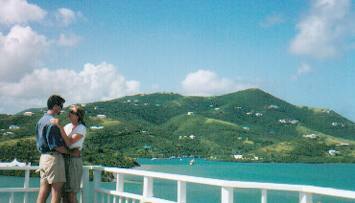 St. Croix is the ideal vacation destination in the Caribbean. Relaxing, beautiful, and uncrowded, yet with a myriad of activities on offer, St. Croix is often called the best kept secret of the US Virgin Islands. As a territory of the US, American citizens don�t need passports, and weddings are easier to arrange. St. Croix�s subtropical climate combined with constant easterly trade winds make it a pleasant vacation paradise any time of year. St. Croix also has the largest barrier reef of any Caribbean island. A vacation day here may include a trip to Buck Island National Monument (a MUST), scuba diving, snorkeling, sailing, shopping, dining, golf, beachcombing, gambling, horseback riding, or other interesting daytrips. Although a quieter and more laid back atmosphere prevails on St. Croix, hot spots for evening entertainment can be found in the towns of Christiansted and Frederiksted. These include reggae bands, jazz groups, and popular folk singers. Depending on your time of arrival you might find full moon parties at various clubs. Or you could always go for the night dives hosted by the local scuba centers or, during nesting and hatching seasons, turtle watches sponsored by the St. Croix Environmental Association! Island taxis are available as are some local tours. The marker is a close indicator to the property location. The rates are per 2 guests for the house. Price Includes:-LISTED RATES ARE BASED FOR 2 PERSONS ONLY. Please contact us or see our personal website for rate details for more than 2 persons. Holiday rates are for the week regardless of number of guests. Price Excludes:-8% Tax and $500 security deposit.